There are things that remain alive in the fire of the heart. That is the true transcendence! The identity of the soul that is recognized between tears, hugs and a plate of hot broth to comfort the heart. Note: To prepare the bouillon, dissolve 2 tbsp. of Chicken Bouillon Mexichef soup in a liter of boiling water. 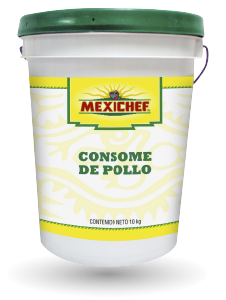 Place in a 3/4 pot of Chicken Bouillon Mexichef, precooked chicken and cilantro. Add the carrots and pumpkins and boil for about 25 minutes until the vegetables soften. In a blender add tomato, chile chipotle and a cup of Chicken Bouillon Mexichef and grind until everything fits together. Empty the mixture into the pot, add salt to taste and cook for about 15 minutes. Serve immediately accompanied by warm tortillas, with a little lemon juice, and if you want a bit of chopped onion.